Napoleon Jinnies cheers for the LA Rams. 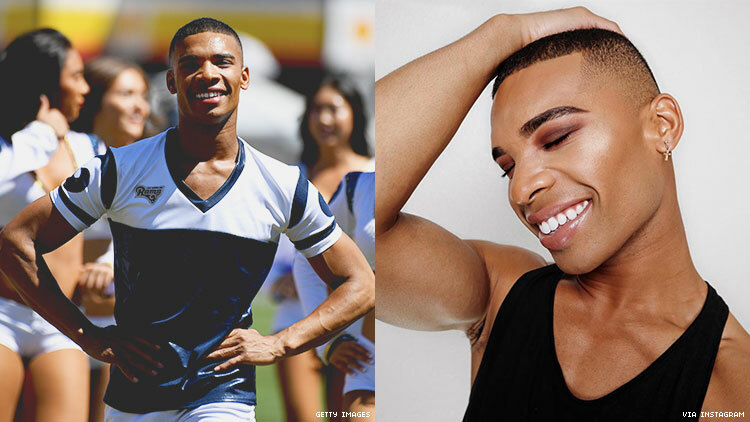 Earlier this month, Napoleon Jinnies made history as one of the Super Bowl's first male cheerleaders, alongside his Los Angeles Rams teammate Quinton Peron and New Orleans Saints’ Jose Hernandez. Jinnies, a former Disney dancer, described his path to the Super Bowl in an interview with Refinery 29, saying it was “overwhelming announcing who you are to the entire world” after making the team. But the road to the Super Bowl was a long one, and as a child Jinnies was the sole boy on his dance team, misunderstood by both his family (his father asked him if he wouldn’t rather do karate) and his peers. “I was bullied for being gay,” he explains. “The bullies would make comments in the hallway and one time, someone put gum in my hair. It got to a point where I didn't want to go to school anymore.” Jinnies eventually went on to dance competitively in college before landing a job at Disney and the rest is herstory.